Gokarna Ganapati temple in the Mahabaleshwar temple. According to the tradition, this Ganapati temple was founded by the early Kadambas (5-6th century), a mighty royal family who ruled over the major part of the Karnataka and part of Goa and Maharashtra. Shree Ganesh, here in the guise of a young Brahmin with two hands, saved Lord Shankara’s Lingam from the hands of demon Ravana who had hited Ganesha; the mark is till present on the mûrti, who is about 5 ft tall. It is necessary to offer Him homage before proceeding to visit Gokarna Mahabaleshwara. It is one of the famous and very ancient two handed Ganapati in Karnataka (the other being Idgunji). It is also called as a "siddha" Ganapati. This temple, albeit located in the same premises as Gokarna Mahabaleshwar, has its own identity. Description : Gokarna is a famous pilgrimage center on the coast of Karnataka, 170 km from Mangalore. Its enshrines the precious Âtma Lingam Mahabaleshwar and is regarded as one of the seven Mukti Stalas of Karnataka (Udipi, Kollur, Subramanya, Kumbasi, Kodeshwara, Sankaranarayana and Gokarna). It has been revered by the hymns of the Tamil Saints (Nayanmars) 1000 years ago. Legends : Vinayakar (Dvibhuja Vinayakar shrine) is said to have tricked the demon Ravana into leaving behind a Shivalingam here in a legend similar to that at Trichy. In spite of the might exerted by Ravana (Maha Bala), the Shivalingam stayed fixed, hence the name Mahabaleshvar. The pull exerted by Ravana, is said to have caused the Shivalingam to resemble the shape of a cow's ear and hence the name Gokarnam. A very similar legend holds at the Vaidyanath - Jyotirlingam temple at Deogarh in Bihar. The temple : This west facing temple enshrines Mahabaleshwar, in a square Saligrama Peetham. A golden rekha on the peetham, and a small hole in its middle permits devotees to have a glimpse of the top of the Âtma Lingam. 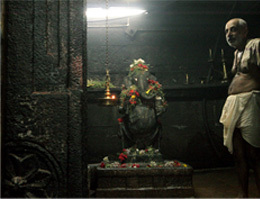 The six foot tall Shivalingam is enclosed inside the peetham, and it can be seen only once in 40 years, when the Ashta bandana Kumbhahishekam is performed. There are also shrines to Vinayaka, Chandikeswara, Aadi Gokarneswara and Dattatreya. Gokarnanayaki is also known as Taamragowri, and her shrine is behind the sanctum. Festivals : It is customary here to have a dip in the sea and then worship a Shivalingam made out of sand, before worshipping at the temple. Maha Sivaratri is of great significance in this shrine. Also located around Gokarna are Sejjeshwara, Gunavanteshwara, Murudeshwara and Dhareshwara. These four temples along with Mahabaleshwara are known as the Pancha Maha Kshetras. Also in Gokarna, another smaller temple is devoted to Ketakî Ganapati.